Sometimes the tasks that seem simple and one-dimensional have much more impact than we realize. Finger counting is a good example. 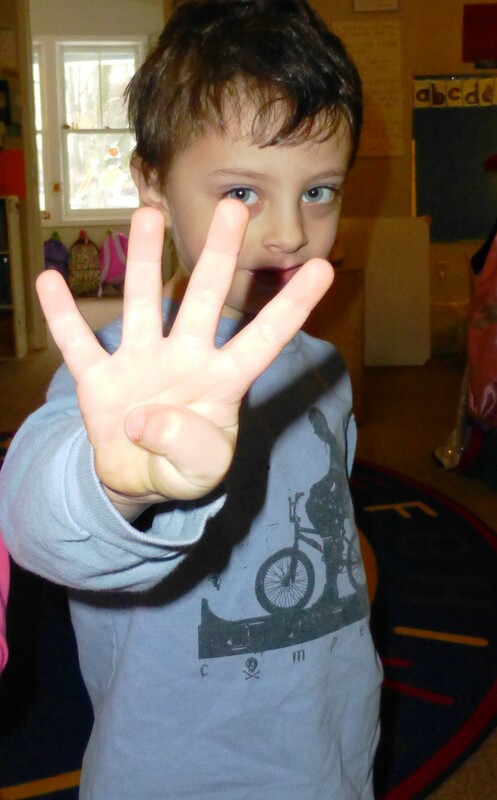 When our children are little, we help them practice counting to five using their fingers. As they get older, they no longer need to count each individual finger, but know the finger configurations for each of the numbers 0-5. Ask a five-and-a-half or six-year-old to quickly show you the correct number of fingers for any digit up to five and they probably won’t even think about it. They will automatically present you with the correct number of fingers. Usually, these older children can quickly use the sets from both hands to represent numbers up to ten without actually counting, either. They are so comfortable with the formation of these sets, that putting the two sets (hands) together to make a new number looks like an easy task. So how do we get a younger child to this level of creating and recognizing sets? Play and practice, of course. In mathematical terms, seeing the quantity of a set without counting is called subititzing. 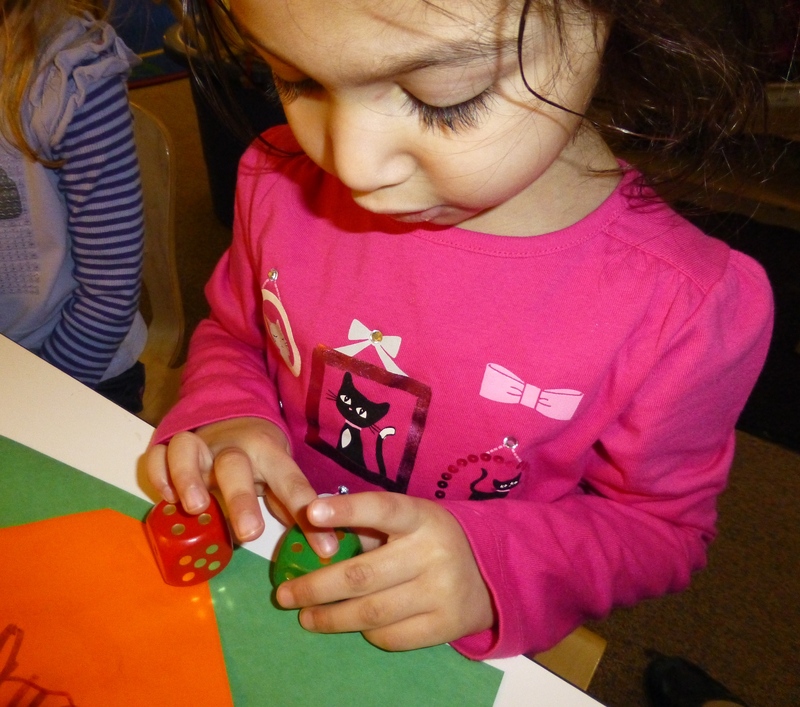 We support this skill by playing games that require the children to recognize arrays of pips on dice and singing counting songs using our fingers. With experience the arrangements on the dice or on their hands become second nature. By the time they are in kindergarten, they will see and identify these sets easily. Being able to visually recognize sets of objects will help them as they move forward into double-digit addition, subtraction and even multiplication. We’ve been using dice with our horse unit to help us get used to these patterns. In the photograph above, the child is rolling two dice to find out how many apples to feed her horse. The red die represents the red apples (or pompoms) and the green die is for the green apples. Each child in the group had a turn to roll the dice and announce the feeding requirements. Our horses are designed using an origami type of construction. The children decorated each horse as they pleased. The folds in the head allowed the horse’s mouth to be opened and closed. With each roll, the children “picked” the correct number of apples and fed them to their ravenous equines. 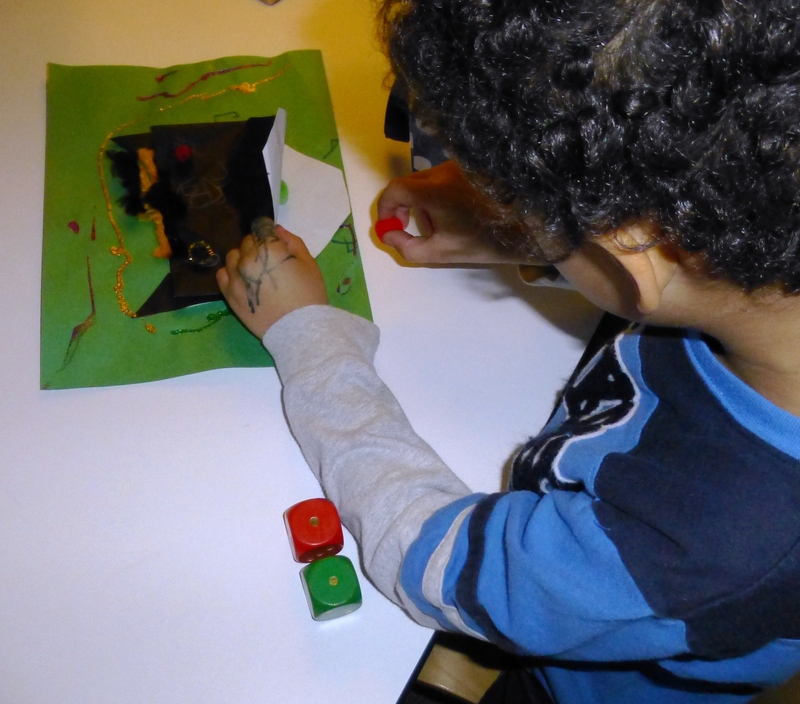 This activity allowed the children to practice their subitizing skills while also exploring addition.